The India Post, Chandigarh: July 18:NCC Cadets of I Chandigarh Naval NCC Unit NCC Chandigarh organised a tree plantation drive at Guru Nanak Public School Sector 36 here today. 105 NCC cadets from the school took part in the event and they planted 500 saplings of various medicinal plants during the drive. Commander (Indian Navy) DV Singh, Commanding Officer, 1 Chandigarh Naval Unit NCC, Chandigarh was the Chief Guest on the occasion. Ms Gurnam Kaur Grewal, officiating Principal, Guru Nanak Public School presided over the function. Nirmal Chatterjee and Kamaldeep Kaur Associate NCC Officers were also present. Speaking to the Cadets on the occasion, Commander Singh highlighted the imperative need for planting more trees. 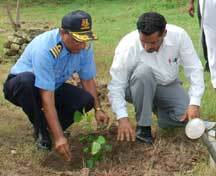 He also called upon the cadets to take a resolve to ensure that the saplings are looked after. The drive forms a part of the NCC activities in the region aimed at promoting a green and clean environment in the city. The drive has been initiated by Brig Rajendra Singh, Deputy Directory General, NCC Directorate Punjab, Haryana, Himachal Pradesh and Chandigarh. NCC Cadets of other institutions have also come forward in large numbers to make the movement a great success. NCC Units under NCC Group HQ Chandigarh also began their respective campaigns at different schools and colleges of UT Chandigarh.